What is ‘The NEW Yoga’? It is ‘The Yoga of Awareness’ - not a yoga of the physical body but of our subjectively felt body, our immortal soul body or awareness body, offering a new understanding of the true nature of ‘yoga’ and ‘meditation’ as such. It is founded on a fundamental principle – The Awareness Principle. This is an original and incisive reinterpretation of the Indian philosophical principle of non-duality or Advaita – and one with profound implications for our understanding of life, science and religion, health and human relationships. 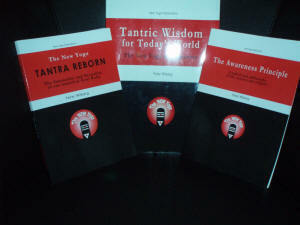 It is the essence of ‘Tantra’ - teaching us to stretch (tan) and guard (tra-) the spaces of our inner and outer awareness of our bodies and ourselves, of other people and the world around us, opening us to a whole new world of awareness. It is ‘Tantric Wisdom for Today's World’ - a rebirth of the ‘Hindu’ Tantric tradition of Kashmir Shaivism or ‘Shiva-ism’, reincarnating the innovative spirit of its greatest adept and preceptor – Acharya Abhinavagupta.. It is a revolutionary yoga – one whose purpose is not to compensate for the stresses and pressures of life created by the economics of global capitalism, but to overcome the global ignorance and lack of awareness on which it is based, not through war or violence but through a global revolution in awareness. It unites the social truth of Marxism with the spiritual truth of ‘Moksha’ – understood as freedom from the ideological delusion that consciousness is the private property of any one class or caste, any one species or bodily organ, any one ego or God. It reveals the essence of 'Shiva' as a personification of that Divinity which does not 'have' or 'possess' but IS awareness - a Divine Awareness that is absolute and unbounded, and of which all things and all beings are an individualised portion and expression. It embraces countless new Yogas or Practices of Awareness. All of these manifold practices allow us to apply The Awareness Principle in our everyday life and relationships, as well as offering a wholly new understanding of the meaning of ‘health’ and ‘illness’. It is not a secular, commercialized yoga of ‘wellness’. Instead it offers a deeply religious understanding and experience of the nature of ‘God’. ‘Yoga’ means to yoke, conjoin or unite. The NEW Yoga allows us to unite with that infinite awareness which IS God, and of which we are all a unique portion. It shatters the single most important dogma shared by both secular science and fundamentalist religions. This is the assumption that awareness is private property, whether a property of our bodies or brains or the private property of beings - human or divine. It is a yoga for the 21st century and beyond. It totally undermines and cuts across the fundamental dualities that are destroying our world – the false divisions between science and religion, politics and spirituality, physics and metaphysics, Western psychotherapy and Eastern theology. It is a bridge. The NEW Yoga is a comprehensive world-view that bridges gap between Eastern and Western philosophical traditions, doing so in a way that is based not only on learned academic studies of Eastern yogic traditions but on lived experience of the profound truths they express. This is a wholly non-commercial, non- profit site, which, unlike many other sites, offers a huge number of articles and instructional materials for free download. Acharya Peter Wilberg in response to questions.